Today, it is a city of temples and shrines abustle with the thousands of devotees who come to visit the city of Lord Krishna. A splendid temple at the Katra Keshav Dev marks the spot that is believed to be the Shri Krishna Janmasthan - the birthplace of the Lord, by his devotees. Another beautiful shrine, the Gita Mandir located on the Mathura-Vrindavan Road has a fine image of Shri Krishna in its sanctum. The whole of the Bhagwad Gita is inscribed on the walls of the temple. The city stretches along the right bank of the Yamuna and the continuous line of ghats along the river makes a splendid spectacle when viewed from the opposite bank. The ghats are believed to have been built at the sites of ancient ashrams, where the great sages performed their penances. These are pilgrimage spots today and centres of religious and cultural activity, where the people come to have their ritual dips in the holy river. 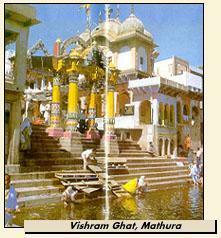 There are a total of 25 ghats in Mathura today, of which the most important is the Vishram Ghat, where according to legend, Shri Krishna took his rest after killing Kansa. It is at Vishram Ghat that the traditional parikrama (circumambulation of all the important religious and cultural spots of the city) starts and ends. The 12 ghats to the north of Vishram Ghat include the Ganesh Ghat, Dashashwamedh Ghat with its Neelakantheshwar Temple, Saraswati Sangam Ghat, Chakratirtha Ghat, Krishnaganga Ghat, Somatirth or Swami Ghat, Ghantagharan Ghat, Dharapattan Ghat, Vaikuntha Ghat, Navtirtha or Varahkshetra Ghat, Asikunda Ghat, and Manikarnika Ghat. To the south, there are 11 ghats - the Guptatirth Ghat, Prayag Ghat marked by the Veni Madhav Temple, Shyam Ghat, Ram Ghat, Kankhal Ghat, the site of the Janmashtami and Jhula festivals, Dhruva Ghat, Saptrishi Ghat, Mokshatirth Ghat, Surya Ghat, Ravan Koti Ghat, and Buddha Ghat. The Vishram ghat is lined with elegant temple and some of Mathura's most important shrines are found here - the Mukut Temple, Radha-Damodar, Murli Manohar, Neelkantheshwar, Yamuna-Krishna, Langali Hanuman and Narasimha temples. The baithak of the great Vaishnava, Shri Chaitanya, is also near by. The aarti held at the Vishram Ghat each evening is not to be missed, for the little oil lamps that are floated on the river set the placid water asparkle with a myriad flickering lights. History tells us that this important site was ravaged and patronized in equal measure over the ages, It was badly damaged during the early invasions but two Vaishnavite saints, Keshav Kashmiri and Vallabhacharya restored its sanctity during the time of Sikander Lodhi. It received lavish patronage during the tolerant rule of Akbar when the temples were repaired and embellished but again time and events took their tool. The town has a number of Shaivite temples as well. The chief among them being the Bhuteshwar Mahadev Temple to the west of the town, the Gokarneshwar Temple in the north, the Rangeshwar Mahadev Temple to the south and the Pipaleshwar Mahadev Temple to the east.